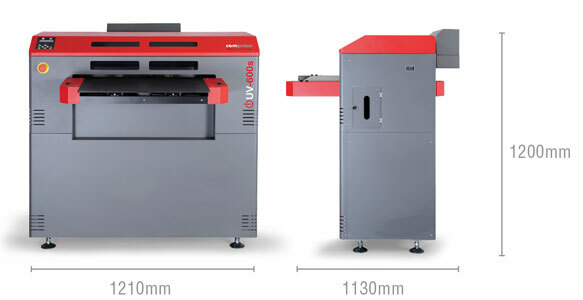 The Compress iUV-600s: Heart pounding UV production! On-demand inkjet (Micro Piezo) 1440 nozzles. 3.5Nq-42Nq drop. Individual 250ml refillable ink tanks. Available with iUV LED pigmented UV-curable inks in 500ml and 1000ml bottles. * Based on dual CMYK. Approximate figures dependent on graphics etc. and are a guide only. White and clear can lower production rates. Additional print modes supported within RIP. Print trials are recommended prior to purchase. © Compress. All Rights Reserved. Your Embroidery Services Ltd, the UK and Ireland distributor of the Compress iUV range, SWF and Ricoma embroidery machines, DTG Digital printers, Print Wizard heat transfer systems and SpangleElite machines.